This Vesta pendant is meticulously hand blown with up to three layers of uncompromising beauty and style. 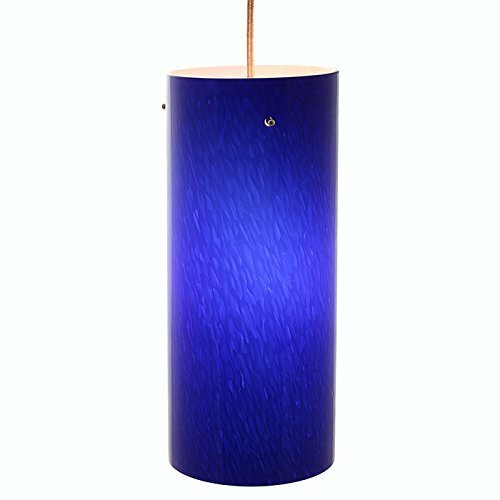 It features hand blown blue glass shade. Accommodates one 12.5-watt LED 800 lumen dimmable bulb. Shade holder available in satin nickel finish. Measures 5-inch width by 12-inch height. The creative, sleek form of this colorful glass pendant light is ultimately appealing. Stone similar shades in enticing colors define the edge, with choices for any decor. The sophisticated shape provides just the right touch of color to any room. Materials:Metal, Glass Shade Color Choices: Gray, Amber, Blue Dimension of Gray Shade:6.9"Dia x 7.1"H (175mmDia x 180mmH). Dimension of Blue Shade: 8.8"Dia x 9.8"H (225mmDia x 250mmH) Dimension of Amber Shade: Dimension of Amber Shade: 8.7"Dia x 7.7"H (220mmDia x 195mmH) Cable Length: 39.4"/1000mm (adjustable, contact us if you need longer) Bulbs: 1x40W G9 Lamp (included, not eligible for free replacement) Assembly Instructions: This fixture does need to be hard wired. Assembly is not required. Professional installation is recommended. Input Voltage:110-120V (North America). 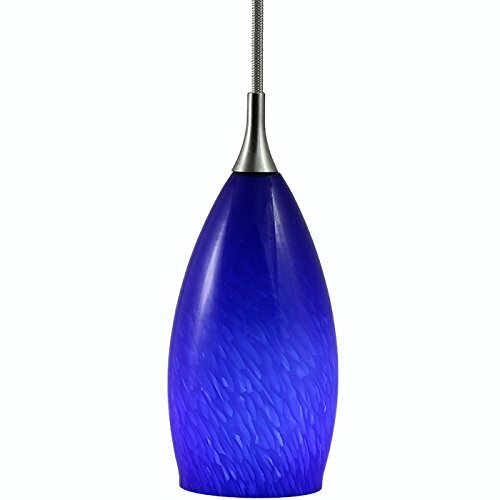 Classic and clean designed blue glass pendant with brushed steel finish top, 6-ft adjustable cord, and matching colored canopy. Field cut cord for custom height or tuck cord back into canopy easily adjust to the desire length. Takes one E27 medium base 60W Max bulb.Base: E27 socket (Medium / Screw-in base) Compatible Lamp type: Medium base 60W Max. Wattage: 60 Watt Max Voltage: 120V Color Finish: Brushed Steel color cord and Canopy Listed: UL & cUL Light bulb not included. This Iridescence storm blue glass pendant is meticulously hand blown with up to 3 layers of uncompromising beauty and style. This layering technique allows the light to spread smoothly across the glass resulting in a warm glow over the entire surface. Accommodates one 5-watt LED 300 lumen dimmable bulb. 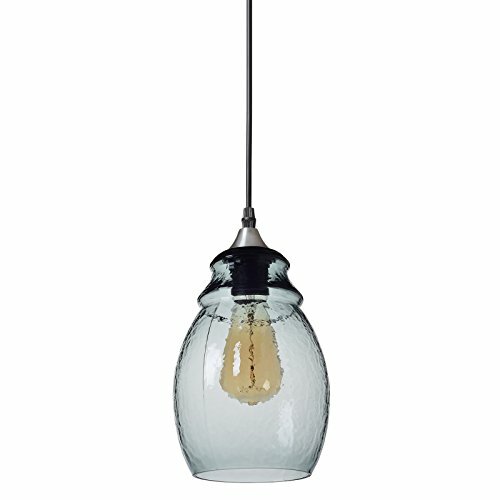 The blown glass style is sure to compliment any kitchen, dining room, bedroom or entry. Ideal for indoor locations. Includes 6-feet clear cord. Available in satin nickel finish. Measures 5-inch width by 11-inch height. 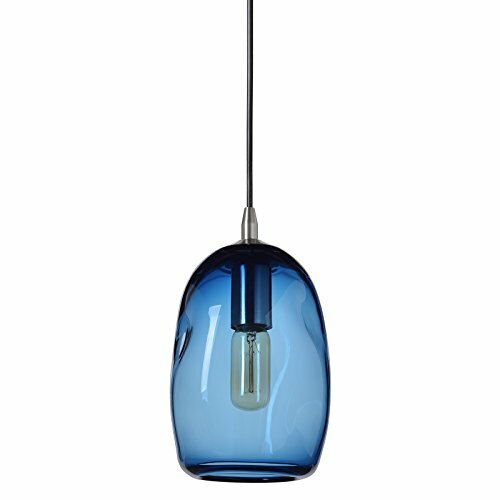 Classic and clean designed blue colored glass pendant with brushed steel finish top, 6-ft adjustable cord, and matching colored canopy. Field cut cord for custom height or tuck cord back into canopy easily adjust to the desire length. Takes one E27 medium base (40W Max) bulb. Base: E27 socket (Medium / Screw-in base) Compatible Lamp type: Medium base 40W Max. Wattage: 40 Watt Max Voltage: 120V Color Finish: Brushed Steel color cord and Canopy Listed: UL & cUL Light bulb not included. 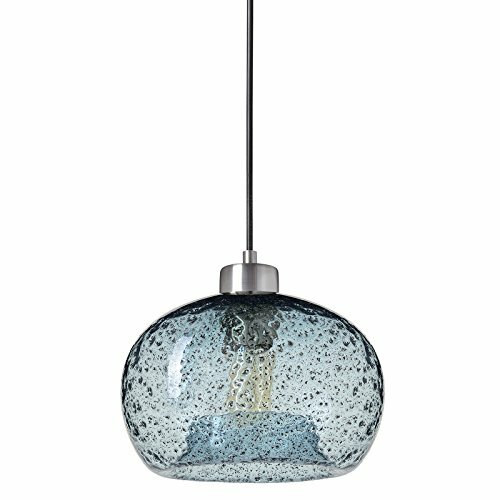 Looking for more Blue Glass Shade Ceiling Pendant similar ideas? Try to explore these searches: Square Candle Tins, Stencil Set, and 2' Hitch Box. Look at latest related video about Blue Glass Shade Ceiling Pendant. Shopwizion.com is the smartest way for online shopping: compare prices of leading online shops for best deals around the web. 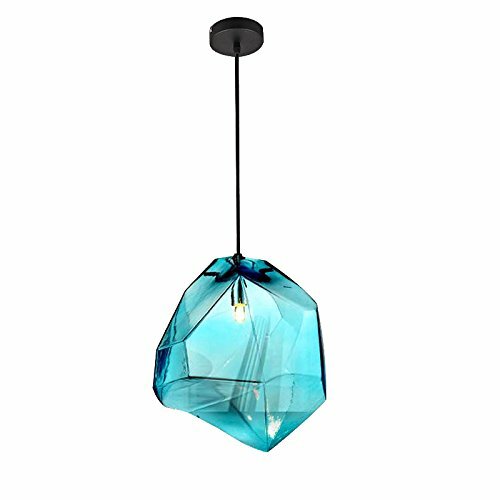 Don't miss TOP Blue Glass Shade Ceiling Pendant deals, updated daily.